I continued to make my way up I-89 and stopped in Randolph—the first town along the way north where I knew that there was a station I could find easily. Since I did not have much time, I did not prepare my usual series of maps showing the exact transmitter and studio locations, so I concentrated my effort on things that I knew to be relatively easy. 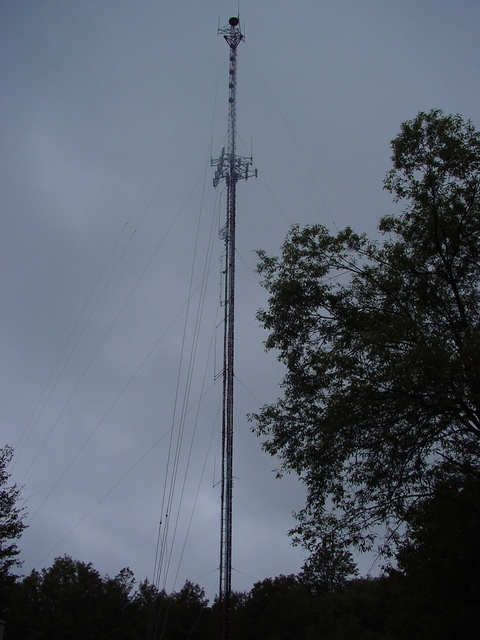 Having missed my turn in Randolph Center, I continued north on state route 14 and was not expecting to see this tower. I believe it to be WCVR-FM (102.1 Randolph), part of the small Clear Channel operation—at two stations it would be ridiculous to call it a “cluster”—here in Central Vermont. I would not be surprised if its operations were consolidated with the much more substantial CCU Hanover/Lebanon cluster back across the river in New Hampshire.